There is a local chain of Middle Eastern/Mediterranean restaurants in Chicago that serves the best dill rice I have ever tasted. Large, individual grains of rice infused with the fresh grassy flavor of the fresh dill, with an occasional lima bean thrown in for that extra bump of texture and earthiness. The rest of the food at Reza's is quite good, too, but it is the dill rice that stands out. I know I'm not the only one who thinks so, because many people find their way to my little ol' blog in search of the recipe. They end up here because I wrote a post back when this was still a knitting blog, when my friend and I stopped at Reza's for dinner on the way to a knitting guild meeting, and I mentioned the dill rice. I can only imagine their disappointment at getting to my knitting post and finding no recipe. I have felt bad about that, but what could I do? Ok . . . wait for it . . . why, I could take a stab at making some dill rice of my own, natch. So I bought some fresh dill at the green market and went to work. And hit the jackpot on the first try. 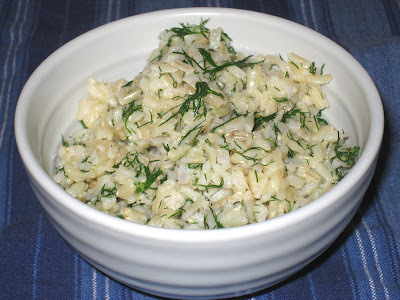 Dill rice adds a fresh dimension to just about any main dish you serve. It's a no-brainer with salmon and peas, but it adds an unexpected dimension to Spicy Indian Channa Dal Curry and other Indian dishes. It's the perfect foil for skirt steak. And it's just as good all by itself. This is really more of a method than a recipe. It works well with my brown basmati rice, but you could make it with whatever form of rice you are most comfortable using. Cook rice according to package directions. When the rice is finished, add the dill and replace the cover, letting it sit for five minutes. Remove the cover, add the olive oil, garlic powder, and salt and pepper to taste. Stir everything together before serving. Add 1/2 cup of frozen peas along with the dill. You should definitely try it, Usha. Dill has become my herb of the season, and it really brightens up the rice. i'm sorry that looks really bad. first you used sticky sushi rice. not the right stuff. it is full of starch and too wet. I'm sorry you think it looks bad, nyazzip, but it is definitely not sushi rice. It is brown rice, and that is usually my rice of choice. It was not my intention to recreate Reza's recipe, just to give a version that works for me. Your method does sound like it would produce something closer to Reza's version, but mine is fast and simple, and I am happy with it. I'm glad you liked it, Alan. Thank you for letting me know!